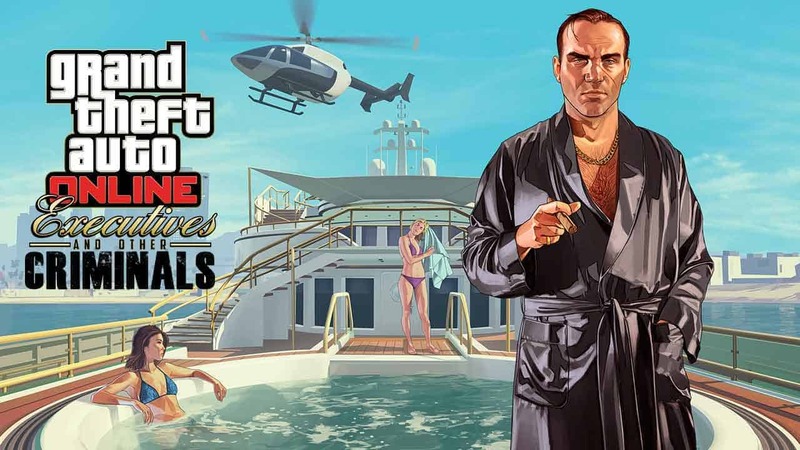 Rockstar Games today sent out word that the Executives and Other Criminals update for Grand Theft Auto Online is now live and available to download for free on PlayStation 4, Xbox One and PC. The latest in a long line of updates for GTA Online gives players the opportunity to try their hand at running their own criminal organization. If a player has more than $1 million in their account that can register as a VIP and create their own organization before hiring up to 3 other players to become Bodyguards within the organization. Players that join an organization as a Bodyguard will be treated to invites with the new SecuroServ app on the in-game phone, adjusting status to “Looking for Work” makes the player eligible to be recruited by a VIP. The VIP is able to drop ammo and armor for members of their organization, as well as vehicles and other favors such as the ability to remove all organization members off the radar for a set period of time. Bodyguards will be paid a periodic salary of $5,000 that also brings in additional cash and RP points for the VIP. Both the organization VIP and Bodyguards will be able to participate in exciting new game modes available within Freemode including Asset Recovery, VIP Work, Piracy Prevention and Executive Deathmatch. 3 Custom Apartments for sale in Eclipse Towers, with 8 customizable themed interiors. 10 new cars for sale, including a Turreted Limo and 6 new executive vehicles with armored variations. 2 new helicopters – SuperVolito and SuperVolito Carbon. 2 new weapons, the Magnum Revolver and Switchblade, each with VIP and Bodyguard variants. Players will now have the ability to purchase a fifth Garage or Apartment. New clothing and accessories, including Robes, Smoking Jackets, Pyjamas and Swimwear.